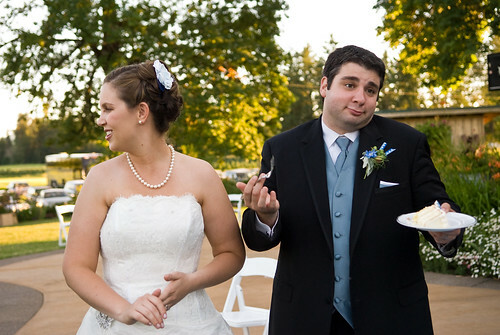 You probably can't tell from the photo, but the cake was the one thing that went wrong at our wedding. It really didn't even come close to bothering me (in fact I didn't fully process it until after the event was over). But our caterer did a little switcheroo on us, and the baker we hired to make the cake didn't make the cake. As a result, it was sloppy-looking and the filling was the wrong flavor! Everyone still loved it, and the caterer handled the situation well, but there's no changing the fact that a cake injustice occurred that day. When I started thinking about what I wanted to make food-wise for our first anniversary today, I had the crazy idea to recreate the top tier of our wedding cake...but with the right flavors this time. I tried to surprise Andy, but he knows me too well and guessed what I was scheming, his only clue being that I was making something. He's good. 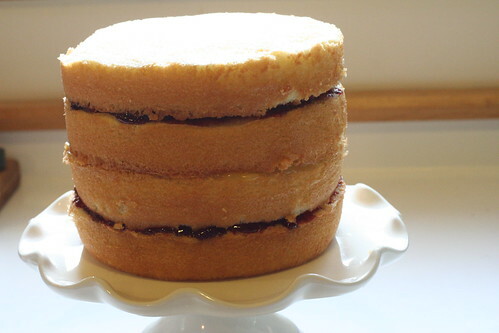 Allow me to introduce you to my first anniversary present to my husband: Yellow Cake with Lemon Curd and Raspberry Jam v 2.0. This cake tasted AMAZING. I think I can safely say that it's the most delicious thing I've ever made, and I'm not even a die-hard cake person. I'm not just saying that because I made it, or because it was for an extra-special occasion, or even because the fillings are my favorite fruity flavors. It's just damn good. Honestly? I think it tastes better than the original (despite my obviously unprofessional presentation!). I used a little 6" cake pan, and baked 4 layers. For the ribbon, I used premade fondant from Michael's, which I colored with my beloved gel food coloring. I used a pastry bag and tip to make the little pearls. Good times. The frosting recipe is Swiss Buttercream, from only the best, Deb at Smitten Kitchen. Oh, and the fillings? Smucker's seedless raspberry jam and Trader Joe's lemon curd. I considered making them from scratch, but really there was no need for the extra effort. 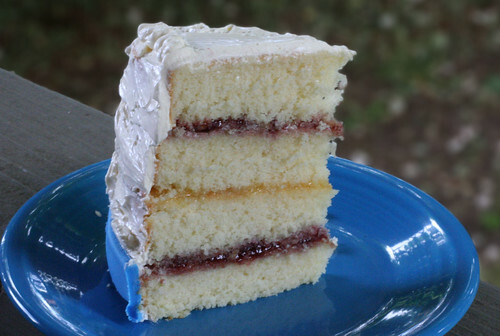 The cake recipe is from my new favorite cookbook, America's Test Kitchen Family Baking Book. There's a whole chapter on baking and assembling wedding cakes. I'm so in love with this book that I may have had the fleeting thought of abandoning everything I've worked for in life to just bake. Uh oh! 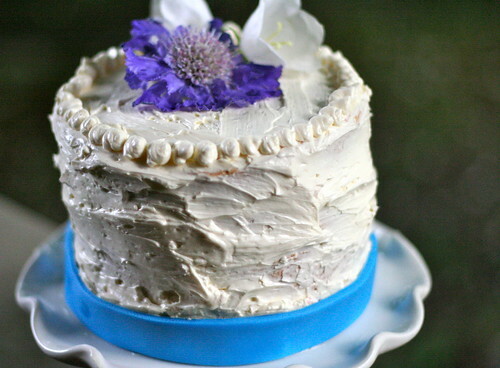 If you're making an actual wedding cake, make this full recipe 3 times. It makes enough batter for one 6-inch, one 9-inch, and one 12-inch layer. 1. Adjust the oven racks to the upper-middle and lower-middle positions and heat the oven to 325 degrees. Grease and flour one 6-inch, one 9-inch, and one 12-inch round cake pan, line the bottoms with parchment paper, and grease the parchment. Whisk the milk, eggs, and vanilla together in a medium bowl. 2. In a large bowl, whisk the flour, sugar, baking powder, and salt together. Beat in the butter, one piece at a time, with an electric mixer on low speed until the mixture resembles moist crumbs, 1 to 3 minutes. Beat in all but 3/4 of the milk mixture, increase the mixer speed to medium, and beat the batter until it is smooth and fluffy, 2 to 4 minutes. Gradually beat in the remaining 3/4 cup milk mixture until thoroughly combined (the batter will look slightly curdled), about 30 seconds. 3. Give the batter a final stir using a rubber spatula to make sure it thoroughly combined. Measure a generous 1 cup of the batter into the prepared 6-inch pan, measure 2 1/2 cups more batter into the 9-inch pan, and scrape the remaining batter into the 12-inch pan. Smooth the tops and gently tap the pans on the counter to settle the batter. 4. Place the 6- and 9-inch cakes on the upper-middle rack and the 12-inch cake on the lower-middle rack. Bake the cakes until a toothpick inserted in the center of each comes out with a few crumbs attached, about 22 minutes for the 6-inch cake, 26 minutes for the 9-inch cake, and 35 minutes for the 12-inch cake, rotating the pans (but keeping them on the same racks) after 15 minutes of baking. 5. Let the cakes cool in the pans for 10 minutes. Run a small knife around the edge of each cake, then flip it onto a greased, parchment-lined cardboard round. Peel off the parchment paper on the bottom of the cakes, then flip them right side up onto wire racks. Let the cakes cool completely, about 1 hour. 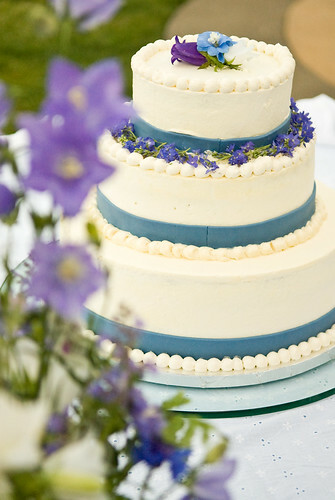 What a great idea to recreate part of your wedding cake! You did an AH-MAZING job. I'm going to have to try those flavors out & btw your dress was gorgeous! Happy Anniv! It's beautiful! You did an amazing job--Happy Anniversary! How fun you recreated the cake! Happy Anniversary! Oh my...what an amazing anniversary surprise. You did a great job! :) Happy Anniversary to you two! I love that you just laughed it out in spite of the cake injustice on your wedding. A couple with the right attitude! Lucky hubby and good you! This cake looks wonderfully delicious! I would have been really mad if someone had pulled a wedding cake switcharoo, but, then again, I made my own (which melted in the heat). Your cake looks divine! WOw wonderful job! truly so very well done!!!! I love this idea. That is really impressive looking! impressive cake, both his and yours! i also like that book you're using, it has lots of delicious recipes. Wow! You did an amazing job, and that cake looks mighty tasty. Happy Anniversary! I think everyone has a wedding disaster! : ) They make for great stories later on. You did a good job with your anniversary cake. Happy Anniversary! 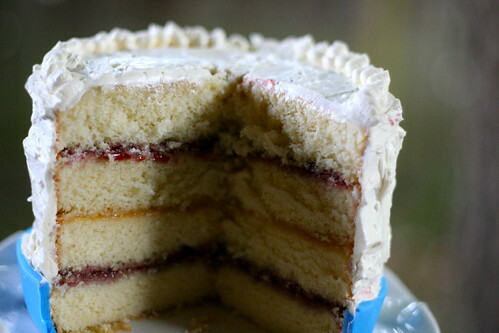 The last cake looks delicious, I love strawberry or raspberry sponge cake! Ok, first of all, as one who ate her fair share of the first version (and probably your share), I would of never known that there was an issue! :) But secondly, I think that it was such a romantic and loving gesture...so perfect for the marriage the two of you have built! That sounds delish! I want to make one so badly!